Odhrán Doherty, from Raphoe Co Donegal quite literally cried his eyes out after finding out that he’d won €1 million, which is equivalent to about $1.12 million. If it comes at a surprise to you that he cried, it shouldn’t because the win came shortly after the 23-year-old farmer had his bank card declined just a couple of hours prior to this life-changing event! Doherty recalled how he was out at a party when he tried to withdraw cash, but his card declined. 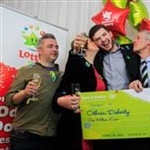 Yet, 72 hours later would you believe it he won $1.12M through the Lotto Plus 1 draw on Saturday and went on to claim the winnings at the Lottery headquarters which are located on Abbey Street in Dublin, with his brother Shane right by his side. “I’m not going to let this go to my head, I have my family beside me and they will keep me right” he declared. He says that this big win is down to his father, who’d headed down to the shop for bread and milk, to discover the shop had neither so he purchased 3 lottery tickets instead, one for himself, his wife and his son. 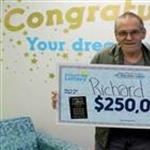 Richard Beare, from Charlotte in North Carolina, has experienced light shine through the darkness he is currently experiencing after finding out that he’s won $250,000 with the North Carolina Lottery after being diagnosed with stage 4 cancer. Beare, a retired auto mechanic doesn’t regularly play the lottery, however on this occasion, he decided to stop off at Quick Trip which is located in Charlotte and buy four $5 tickets which were Carolina Black tickets. Upon checking them, it was fourth time lucky for him as his very last ticket was the winner – he wasn’t sure if he’d won until he clarified what the matching numbers meant with the clerk. Beare then said “Well, I guess we just won $250,000 then”, and the clerk was so surprised she kept looking at him and the lottery ticket he was holding. The winnings will be worth around $176,876 after several withholdings. Two siblings, who have opted to protect their identity are over the moon after finding out that they’ve been a $2,000,000 lottery prize with the Powerball Lottery! One of them lives in Johnson County, whilst the other lives outside there and they explained that they are not regular Powerball players, but when they saw the jackpot souring, they said not buying a Powerball ticket would have been a wasted opportunity. 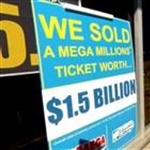 They ended up buying four tickets in total, with three being Quick Picks and the fourth ticket – they decided to choose the numbers to play themselves. They chose numbers using ages of different people in their family, and this fourth ticket ended up being the winner – matching five of the total six numbers! A man who has opted for anonymity, from Melbourne in Australia has come forward as the winner of not one, but TWO $23,000,000 lottery draws! The man from St. Albans can’t believe his persistence has finally paid off, as he explained that he has been playing the same lottery numbers for the past 3 decades... that’s right, 30 years of playing the same numbers over and over again. On this occasion, he purchased his first lottery entry from Footscray, and a second entry from St. Albans however he was under the impression that he’d bought tickets for two different lottery draws, when in fact both of his entries were for the same lottery division. The blue-collar worker, he was contacted numerous times to be told that he’d won double the prize amount, a sum of $46,600,000 but were unable to get through to him for a while. Eventually, he picked up after finishing work and about to check the lottery results online until he was told that he was a big winner. After lots of excitement, whispering and deliberation about the $1,500,000,000 Mega Millions draw – the official winner from South Carolina has stepped forward anonymously to claim her life’s fortune! This jackpot caused huge enthusiasm, and exhilaration across the country as millions waited eagerly for the winning numbers to be revealed as the prize amount was the biggest claimed by a single-winner. The winning numbers were: 5, 28, 62, 65 and 70, with a Mega Ball of 5. The winner from South Carolina told the story of how she was in Greenville running a few errands, when she decided to go for a drive through a beautiful route to relax and passed a KC Mart on the way where she saw signs notifying her of the huge jackpot which is what enticed her to go into the store located in Simpsonville, South Carolina to buy a ticket. 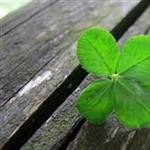 The following morning, she checked her ticket as the drawing happened the night before and was in pure awe when she realised that all her numbers matched up..
$4 Million St Patrick's Day Gift! A 28-year-old woman from Wayne County, in Michigan has quite literally had her dream come true after winning the lottery following a premonition she’d had. The woman, who opted to remain anonymous told the story how she’d had this dream that she was going to win, which very heavily influenced her actions after this – specifically buying $30 scratch-off tickets on a regular basis. She bought her ticket from Valero gas station, which is located at 3801 West Vernor Highway, in Detroit and began scratching it off when she saw “4MIL” on the ticket and immediately started crying and shaking, she told the Michigan Lottery in a statement. She was so bewildered, that she rang her friend and got him to verify the ticket and double-check for her. North Carolina Man Wins Second $1M Lottery Prize from Same Store! 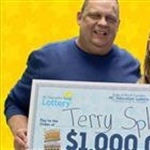 Terry Splawn, from North Carolina has overcome unfathomable odds after winning a second $1,000,000 lottery prize, from the very same retailer in a little under 2 years. Splawn, won his first prize back in April 2017 with a Millionaire Bucks ticket which he bought from Sam’s Mini Stop. Fast forward to 2019 he went back to the same store which is located on Old Charlotte Road, in Concord and purchased a $150 Million Cash Explosion ticket, which is a scratch-off ticket and soon found out that he'd won $1,000,000 all over again. “I can’t believe I won the lottery not once, but twice!... I just thought, this can’t be happening”, it’s not impossible but it’s definitely a rare case of luck, said a UNC-Chapel Hill statistics professor, by the name of Jan Hannig as this occurrence beats odds of 1 in 1.8 million, and that’s just the odds for the lottery win that happened this year, let alone the combination of both the tickets together.